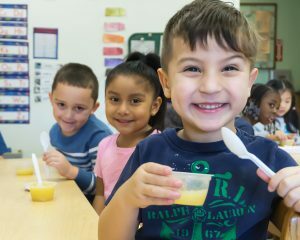 The Empty Bowls Naples Grant will help CCCR provide over 100,000 healthy meals to children ages one to five years. Child’s Path provides full-service, affordable childcare for children ages 1-5. At Child’s Path, we feel the key to a child’s success is balance. While children have a great capacity for learning, they are still children who should enjoy part of their day running, laughing and playing with their friends. It is a place where children come to learn, play and shine. Our goal is to ensure a nurturing environment where children can flourish both academically and socially. Child’s Path’s educational philosophy is to give each child a positive experience where they can build healthy self-esteem. We accomplish this goal by creating a fun, hands on approach to learning for the whole child focusing on their social, emotional and physical well-being. Teachers base lesson plans on the nationally recognized Creative Curriculum which helps children explore the world around them by using all their senses. All of our employees are thoroughly screened. All of our lead teachers are required to have a Child Development Associate (CDA) credential and all staff are trained in infant and child CPR. Kindergarten readiness is an important consideration for parents. Child’s Path’s programs are designed to prepare children for that big transition. From a young age, children are gradually introduced to the exciting world of colors, letters, shapes and numbers through creative art projects and activities. Child’s Path participates in several evidence-based programs that improve children’s self-esteem, problem solving skills as well as social-emotional and academic skill development. The second step is a prevention program for 3, 4, and 5 year old children that teaches lessons about character, being a good friend, sharing, self-regulation, telling the truth and respect. The ultimate goal of the PAPY Program (Prevention Activities for Preschool Youth) is to work with parents to build a strong foundation that will enable children to develop into happy, confident young people. Natural play is based on the theory that one of play’s major functions is to teach children how to regulate fear and anger. During our natural play time, youngsters may experience anger, frustration or get hurt but to continue playing and the fun, they must overcome in. During this imaginative play they are exposed to natural consequences that ultimately increase cooperation, builds tremendous sense of self-confidence all while decreasing conflict. Year round, Monday – Friday, 7 a.m. – 5:30 p.m.